Posted on January 28, 2015 by Sumit Gilhotra. Update:- Hp board matric (10th) date sheet released- exams starting from 4th March 2015..
Himachal Pradesh Board of School Education or HPBOSE, established in 1969 as per Himachal Pradesh Act No. 14 of 1968. In January 1983, HPBOSE head-quarters has been shifted from state capital Shimla to the Dharamshala city. . Every year large no. of students take part in HP board matric examination. HP board is renowned in North India region. 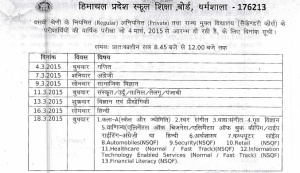 Hp Board 10th Date sheet 2015 is released. According to HPbose Class 10th (Matric) Date Sheet the HP secondary course regular exam will be start from Wednesday, 4th March 2015 till Wednesday,18th March 2015. HPBOSE manage and supervise the education system under the state government of Himachal Pradesh. About 34 officials has started this HP board and now it has been increased to 438 members. The HP board provide best education with better courses, updated syllabus and text books in the state school. HP board matriculation date sheet is Live now. HPbose conducts examination of 10th and 12th courses every year in March/April. The HP board Matric Time table 2015 is fruitful to each student for best preparation for 10th exams. Our official page for HP board will help students to get the HP 10th board schedule and learn with proper time management. 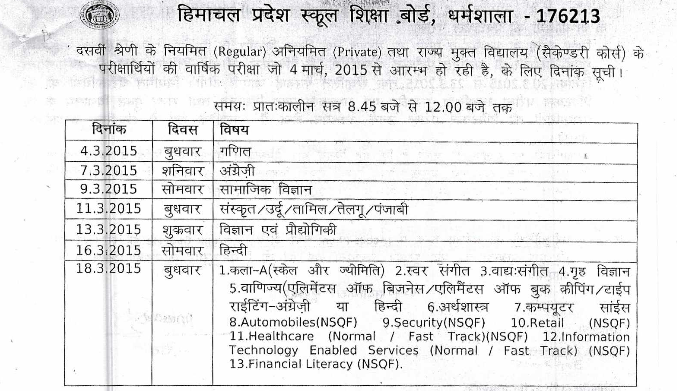 This HP 10th Date sheet is applicable for all regular, private and HP state Open School students 2014-15 Batch. Indiaresults.com is the no.1 exam result portal in India. All the details for board exams and results are available at our portal. Name wise search option is a very special feature available on website. Stay tuned for instant Updates and Result notifications from Hp board 10th Result 2015. Student can collect their examination related data or document from our official page for HP Board at IndiaResults.com portal.